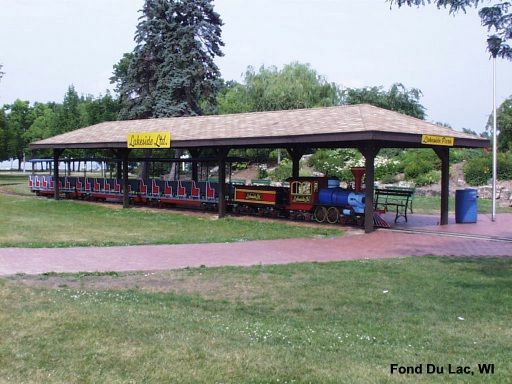 In May of 2001 we purchased a concession building, carousel, miniature golf course and a Miniature Train Company G-16 train and started off on an adventure. Not knowing anything about trains much less G-16s I soon found out that the learning curve to familiarizing myself with the train was going to be steep. I�m not a mechanic, I had no manuals, I didn�t know the mechanical history of the train, I didn�t know where to find any information about the train or even if they still made them and the former owners of the train said that parts are hard to find and very expensive and then quickly disappeared after the sale went through. Leaving me with little more then the internet to answer my questions and not finding a lot there I decided something had to be done. With your help I hope this web site will grow to be a resource for owners of trains made by the Miniature Train Company of Rensselaer Indiana. The Miniature Train Company produced a number of different trains including a E-10, G-12, S-16 and G-14, G-15, G-16. Unfortunately I don�t know a lot about the E10 and G-12 as they are substantially different then the others and this is why they are not covered within the pages of this website. I would welcome any information people would like to contribute to the website regarding these trains and I encourage submission of articles (I am more then willing to create a E-10 or G-12 web page). The S-16 was built to look like a Steamer but I believe many of the parts are exactly the same as those on the G-14, G-15, G-16s. The G-14, G-15, and G-16s were produced to resemble an EMD F7. The number 14, 15 or 16 represents the gauge of the track the train runs on. I suspect that the G-14, G-15, G16s utilize much of the same equipment and therefore would be relevant to conversation within this web site. I plan on sharing as much of the information as possible about what I�ve learned about these trains, including resources for parts, servicing, licensing, web sites and other train owners. If you find my information to be in error I would greatly appreciate it if you would drop me an email with the correct information. I�d also invite anyone�s input, questions, or comments regarding any subject having to do with the MTC trains. This site is meant to be a continuing work in progress and therefore if you�d like to receive an email update when significant changes are made please sign up for the mailing list. If you have a train and a web site for it please send me an email with that information. From what I have learned each train produced by the Miniature Train Company has a specific number on it, a serial number if you will. 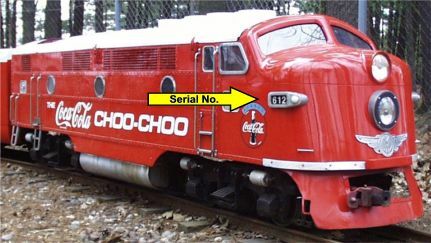 These numbers are located on the �nose� of the train and on manufacturer plates that were originally affixed to the trucks, cars and locomotive body (at least on the G-16 models). While looking at various trains I have found that over the years these numbers seem to disappear from the train. Without them there is little chance of finding out the manufacture date of the train. For example the number of my train is 612, knowing this I can call the Allan Herschell Company or Andrew Jugle in Elmhurst IL. And they may have records indicating when that particular train was shipped from the factory and where it was shipped to. 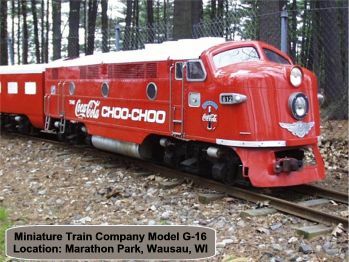 Train 612 was shipped to Park Concessions, Inc., Wausau, WI in May of 1952. If your really interested in learning the history of your train take a trip to your local historical society or museum. If you have some idea of when your train arrived locally your neighborhood library may have old newspapers on microfiche that you could look through to gather information. The other suggestion would be talk to the older folks in the community and ask when they think it arrived. If the train is located in a municipal park normally your local park department can provide information, I would suggest talking to people who work at the park every day rather then the people in the office, but try both. Website created by: Scott Winter. Copyright � 2005 Scott Winter. All rights reserved.